Outfit details: Uniqlo ribbed top, Everlane Day Heels (read my full review here), vintage silk trousers, Forever 21 sunglasses, Forever 21 earrings. My current style inspiration is a return to monochrome, and specifically shades of white. 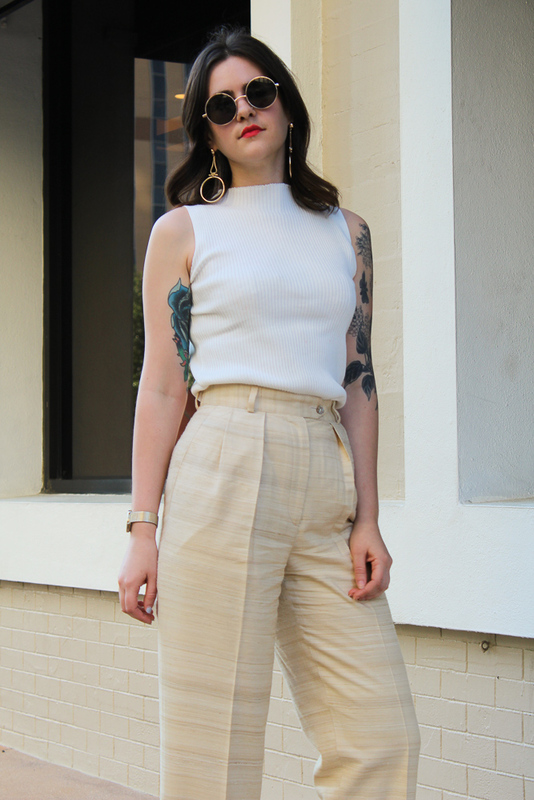 I love the effect of the slight contrast between these oatmeal colored trousers and the crisp white top. These trousers are the product of a recent all day thrifting expedition with my friends Kristina and Ian. We shopped all day and it was like a bitchier version of supermarket sweep. Imagine three sassy leading ladies sprinting down the aisles of a thrift store, arms overflowing with hangers, while shouting out the occassional "yasss" and "do I love this or hate this?" I made a recent trip to Uniqlo to stock up on some basics. My wardrobe is mostly vintage statement pieces, so chic, modern basics are imperative to balance things out. I love Uniqlo for their style and quality. I always stock up on their high rise jeans and tops, but they have tons of other cute stuff.